Continuing with our March Friday Hall of Famers celebrating members of the League of Themselves, we’re adding a touch of feminine pulchritude…. Joan Lunden (born Joan Elise Blunden on September 19, 1950) is an American journalist, an author, and a television host. Lunden was the co-host of ABC's ‘Good Morning America’ from 1980 to 1997, and has authored eight books. She has appeared on the ‘Biography’ program and Biography Channel. As of 2014, Lunden is a special correspondent for NBC's ‘Today’. For more about the newswoman, click here. A roman a clef novel titled “Tanged Banners” was published anonymously (a la “Primary Colors” in the Trueniverse) and people began to believe that it had been written by ‘Lateline’ reporter Al Freundlich. But a little girl who was the “reporter” for the kids’ version of ‘LateLine’ figured out it was actually written by Joan Lunden, based on similar phrases in the book and used by Lunden in a cooking show. Murphy decides not to work for the White House and goes back to her old job at FYI. All is well again until she finds out thanks to the news piece that was assigned to her that she may have breast cancer. Murphy gets invited to the White House by the Clintons. Once she gets back to the office, she finds out she has a furry stowaway. Apparently she accidentally ended up with the Clintons' pet cat. Murphy is feeling even crankier at the end of her pregnancy and isn't happy that Corky is throwing her a baby shower. But she changes her mind when she realizes she will be getting terrific gifts from her peers [who] work in national news. 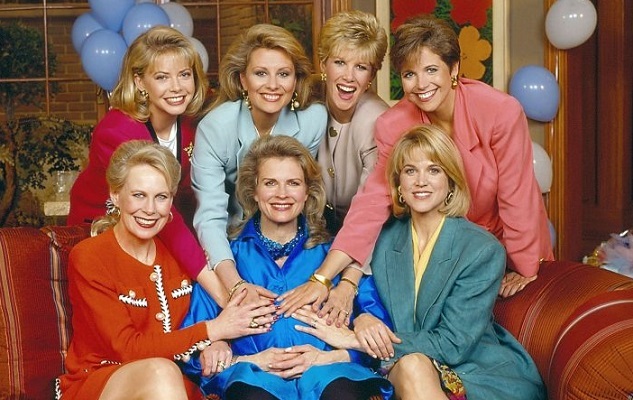 The episode "A Chance of Showers" (episode 4.25) featured cameos by actual newscasters Katie Couric, 'Faith Daniels', Joan Lunden, Mary Alice Williams and Paula Zahn. Joan Lunden is a multi-dimensional. 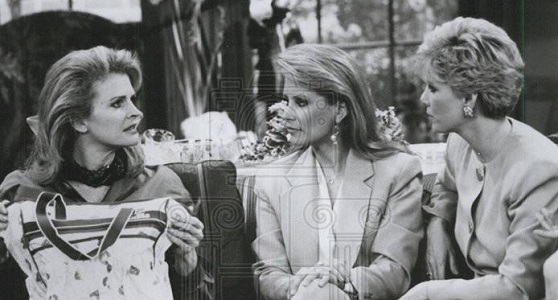 Along with the appearances in ‘Murphy Brown’ and ‘LateLine’, she also appeared in the alternate Toobworld of sitcom Presidents…. Former President Graves is giving a speech at a VA facility. Rudy Giuliani and Bill Richardson, are with him. On the drive back to Graves' residence they have the driver pull over, and Graves leaves there, out in the desert. At home, Graves meets his new assistant, Isaiah. He sneaks out without his Secret Service detail, goes to his Presidential library, takes a few things, then to a restaurant, and end up outside the waitress' trailer, smoking pot. Isaiah goes into the trailer for some munchies and when he returns, Graves and the waitress are gone. Both Graves and Isaiah eventually return to the residence. Graves' wife, Margaret and his daughter Olivia are also introduced. Joan Lunden introduced former President Graves at the VA ceremony. Ms. Lunden may have only been name-checked in this episode. After learning his longtime friend and political ally ex-U.K. Prime Minister Trevor Lloyd is dying of cancer, Graves takes off to see him in Baltimore for one last adventure. Isaiah and Sammy join him, and Isaiah gets a peek behind the curtain when she takes him to visit her family. Olivia enlists Jeremy’s help when she realizes she’s in over her head with Arturo and Margaret finds herself falling into familiar patterns as she and Dalton strategize on her campaign. However, none of those can legitimately be absorbed into the TV Universe. She appeared on ‘The New Hollywood Squares’ back in November of 1987 and ‘Hollywood Squares’ will one day be a part of the TVXOHOF itself one day. She also appeared in a lot of wrestling shows – now, I’m not as keen about their legitimacy for my view of the TV Universe, but there’s no denying their fictional aura and even a few fictional characters who have appeared in those shows. Joan Lunden doesn’t need those shows to qualify for Hall membership but they add “flavor” to her tally. Welcome to the Television Crossover Hall of Fame, Ms. Lunden!